According to the military, the rocket was fired from the Gaza Strip, where last week two rockets were also fired at Tel Aviv, in what was described at the time as an apparent “mistake” by the Hamas terror group. Police said the projectile early Monday struck a building in the community of Mishmeret, on the Sharon plain, causing it to catch fire. The shrapnel from the rocket attack also caused significant damage to the surrounding area. Firefighters and search-and-rescue workers arrived at the scene to extinguish the blaze and look for any survivors who might be trapped in the destroyed building, the fire department said. 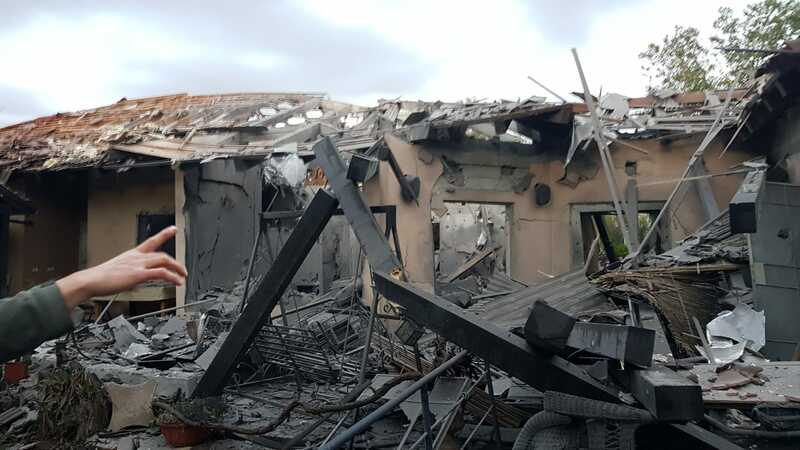 This attack on Mishmeret, located over 80 kilometers (50 miles) from the Gaza Strip, was the farthest reaching rocket attack from the enclave since the 2014 Gaza war, during which projectiles reached as far north as the city of Haifa. The distance of the attack and significant damage caused by the impact indicated that it was conducted by one of the larger terror groups in Gaza — either the Strip’s de facto rulers Hamas or the Iran-backed Palestinian Islamic Jihad — who have access to the types of long-range projectiles with heavy warheads necessary for such an attack. Initial assessments of the attack indicated that the Iranian-designed Fajr-5 rocket was likely used in the attack though this has yet to be confirmed. As of 7 a.m. Monday, no terror groups in the enclave have taken responsibility for the rocket launch. There were no immediate reports of an Israeli retaliation. They were taken to Kfar Saba’s Meir Medical Center for treatment. A dog belonging to one of the families in the building was also apparently killed in the rocket strike. A short while later, an explosive device that was also apparently flown into southern Israel from the Gaza Strip detonated in a community in the Sha’ar Hanegev region, causing neither injury nor damage, a regional spokesperson said. Israel says the demonstrations are orchestrated by Hamas in order to provide cover for the organization’s nefarious activities along the security fence, including infiltration attempts, the planting of explosives and attacks on Israeli soldiers. This entry was posted on March 25, 2019 at 8:09 AM and is filed under Uncategorized. You can subscribe via RSS 2.0 feed to this post's comments. You can skip to the end and leave a response. Pinging is currently not allowed.